In 2014 Led Zeppelin re-released its first five albums in a remastered version with a second disc including alternate or live versions. On WoNoBloG we focus on the original album and test it against the passing of time. This is the fifth installment as has been explained before. IV opens with the single released in The Netherlands some time after the album's release: 'Black dog'. A song that I've always been somewhat ambivalent towards. On the one hand it is a fine example of the way Led Zeppelin was able to drive a riff driven song past all that was done before and set a standard for those who followed. Where would a band like Aerosmith be without this song e.g.? Probably somewhere else. The stop start of the band with Robert Plant wailing away in between is exemplary. On the other hand I often think that 'Black dog' is not good enough. The band has done better than this. And still, this is an über rocksong. The difficult riff, a stop start in itself, the great smooth bass playing in the background and John Bonham pounding away in such a light way for such a heavy song. Let's stand off and declare 'Black dog' is a great opener for IV. What happens next is one of the capstones of Led Zeppelin's career. The aptly titled 'Rock and roll' is so much fun. So incredibly good. Such a showpiece of what this band could do. Although I heard the song for the first time, as far as I remember, in a live version on a Heart album, this version took control directly after hearing it somewhere in the mid 80s. John Bonham kicks it all off. The riff of Jimmy Page, who also adds a slide here and there leads it all. "It's been a long time since I rock and rolled" sings Plant and sounds like he means it. Bonham and Jones keep up the incredible rhythm and let the other two do their thing. After the guitar solo a single note piano is added. Man this song is so good and so much fun to listen to. Simply one of the best rock and roll songs ever. It has it all. And how many times have I wrote a line like that in the past four reviews. A few times I guess. 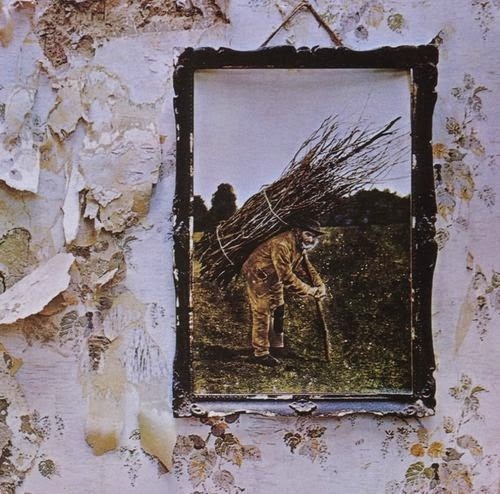 The many faces of Led Zeppelin are shown to great avail on IV. The contrasts are so incredibly huge again. The mandolins come in for 'The battle of evermore'. One of the songs in which Led Zeppelin reached it peak in this genre as far as I'm concerned. All folk songs before IV was a step towards this song. Over 40 years later Plant still tries to reach this peak and certainly came close on his latest album 'Lullabies ...' On this song Robert Plant gets assistance from Sandy Denny. An unique moment for the band, as no other song was done with guest vocalists. What to say of song #4? All has been said and done here, books and articles may have been written on 'Stairway to heaven'. A song of fabulous beauty combining folk, rock and finally even hardrock. Layers of guitars, from major parts to small ones only playing single notes or an embellishment. The fleeting mellotron. The hardhitting Bonham driving the soft song to the extremes. And Plant? He leads us into a fairytale land where nothing is as it seems. Simply one of the best songs ever made and I can't imagine that to changes in the coming years. Side 2 of the LP kicks off again with a riff driven song. 'Misty Mountain hop' is driven by the guitar, electric piano and bass (pedals?) all echoing the same riff. Robert Plant floats over the riff and takes command in the bridge parts. 'Misty Mountain hop' is another example of the way Led Zeppelin can make fun in music also. It makes me smile listening to it. All the little changes in the sound and melody totally add to that feeling. Simply another example of how good this band was and what it was able to play. 'Misty Mountain hop' is playful. The song has a lightness that is welcome after the first four songs and is good enough to get away with this lightness. 'Four sticks' lays that veil of seriousness over the album again. The singing tips over the edge. Robert Plant disappears into his wailing gnome sound, as if not really knowing what to make of 'Four sticks'. Because the band keeps the song together, it tips to the right side of Led Zeppelin's oeuvre. There are some slight eastern motives as well. The epitome of that will be reviewed later in the year I guess. 'Going to California' is another folk song. Acoustic guitar and mandolin come to the fore again. Intricate motifs are played. Plant reminds us of girls with flowers in their hair, who probably had all gone back home in 1971. 'Going to California' is a delicate song and Led Zeppelin totally gets away with it. It ends a bit uncertain, but that is fine. Just well played and extremely well sung. 'When the levee breaks' is the closest to a blues Led Zeppelin comes on this album. The link with a traditional blues is left behind on IV. The band has moved on since its conception in 1968. Although this is a traditional blues song, co-credited to Memphis Minnie, there is not much left reminding the listener of a traditional 12 bar blues. The song is blown up with elaborate harmonica playing and some fine slide guitar playing. Again Plant shows how he has grown as a singer. He can make an impression without tearing his lungs inside out and back. Again I'm confronted with the question what is the best Led Zeppelin album. I always answered 'House of the holy' in the past years, but truthfully I can't answer that question anymore. It could be 'I', 'III'. 'IV' or 'House of the holy' on any given day. All albums with fantastic songs, diversity and growth. Such personal and musical growth. Somewhere in 2015 the other albums will be re-released. I wonder what my opinion will be. I do not even have the albums on cd past 'Physical graffiti'. All albums that I have not regularly played in the past decades. So things may get exiting (or not).